The BA Taha Hussein Library for the Blind and Visually Impaired, in cooperation with Istabraq Association for Family and Societal Development, and the General Syndicate for Workers in the field of people with special needs, holds a training program for students of El-Nour School for Visually Impaired Girls from 3 to 6 February 2014. 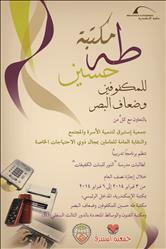 Within its endeavor to integrate the visually impaired and spread awareness among the sighted on the culture of integration, the Library holds two public lectures: “Technology and its Role in the Life of the Visually Impaired” on Monday 3 February at 1:00 am, and “There is a Visually Impaired Person Around” on Tuesday 4 February at 12:00 noon. Both Lectures are held at the Arts and Multimedia Library, B3 Floor, Main Library.